Heterobasidion fruiting bodies (i.e. shelf-fungi) growing at the base of a dead pine. (photo from Joseph O'Brien, USDA Forest Service, Bugwood.org). Heterobasidion Root Disease (HRD), also known as Annosum or Annosus, can be a devastating disease in pine plantations. It was found for the first time in Minnesota in late 2014. 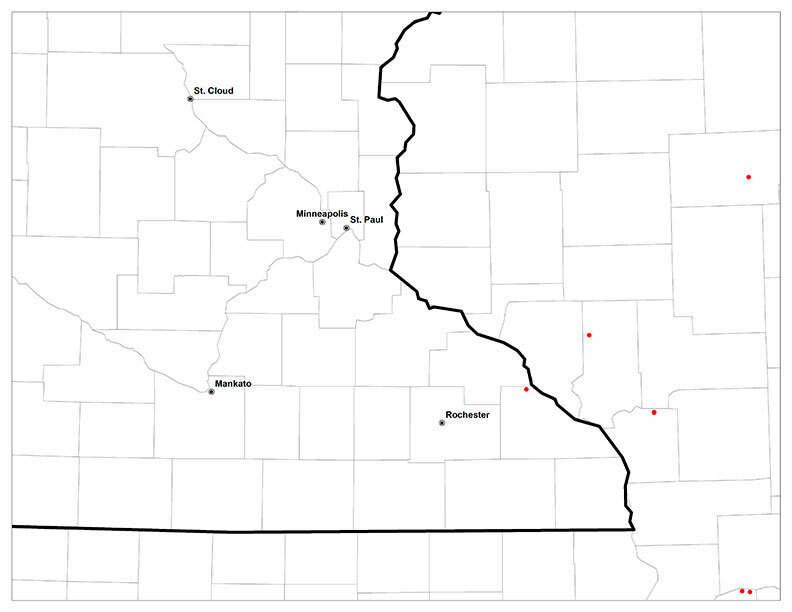 The HRD in northern Winona County represents the only known HRD location in Minnesota, as of March 10, 2015. Check the map for locations of HRD. Pine Planation. (photo from Joseph O'Brien, USDA Forest Service, Bugwood.org). Heterobasidion irregulare, a root pathogen, causes Heterobasidion Root Disease of pines and balsam firs in the Upper Midwest. 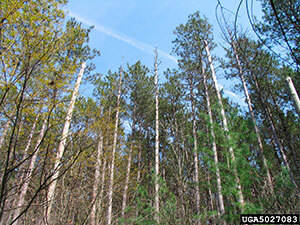 HRD appears as decline and death in expanding circular patterns in pine stands and can be a serious economic disease. Once it gets into a site, it remains there for decades. HRD starts in a plantation when windborne spores land on freshly cut stumps. The disease progresses from stumps, through roots, to adjacent living pines and balsam firs. Disease symptoms first appear 3-8 years after a thinning. HRD can be prevented in Minnesota with a registered fungicide called Cellu-treat®. It can be applied by backpack sprayer or through sawbars on harvesters. 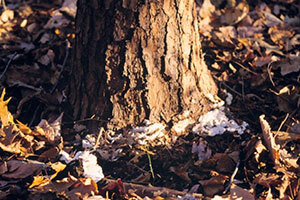 There are two common look-alike diseases: Armillaria root disease and red pine pocket mortality. Heterobasidion spores are released from conks (shelf fungi) typically found growing at the soil line on stumps and dead trees.